Granville, N.Y.—The Slate Valley Museum is looking for people that can stitch or sew winter hats, mittens or scarves, or those who are willing to give it a try. As part of its Festival of Trees which is opening on Friday, Dec. 2, they will be handing out handmade items to children. They are looking for volunteers willing to make and donate some of these items. Email director@slatevalleymuseum.org or call at 518-642-1417 to see how to be a part of this. “We want to give something back to the community this season, especially to the children,” said Krista Rupe, executive director of the Slate Valley Museum. Not a knitter? Others can help by bringing non-perishables to donate, which the museum will give to local food shelves. The second annual Slate Valley Festival of Trees is a community-driven holiday celebration that engages people from all walks of life in a vibrant cultural setting. The opening celebration will take place on Friday, Dec. 2 from 4-9 p.m. with a visit from Santa and Mrs. Claus. The event coincides with the Village’s holiday celebrations. The Slate Valley Museum is located at 17 Water Street in Granville, N.Y. For more information, visit slatevalleymuseum.org. 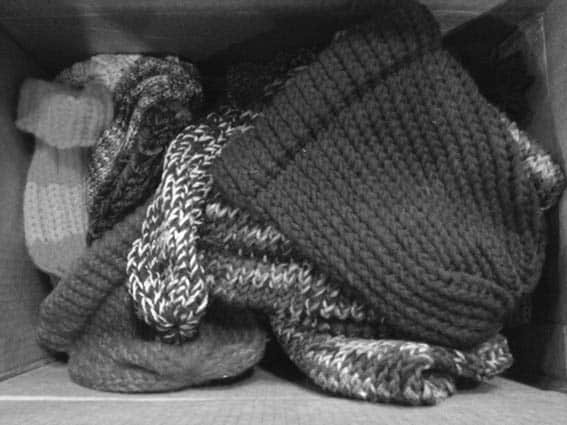 A box full of hand-made hats, mittens and scarves was made by local knitters and crocheters to be donated for area children. Join them and embrace your skills!